Social media and tourism marketing go hand in hand. Taking on social media can be challenging, especially with limited time and budget. In this series, I explore best practices for destinations and attractions across different channels. 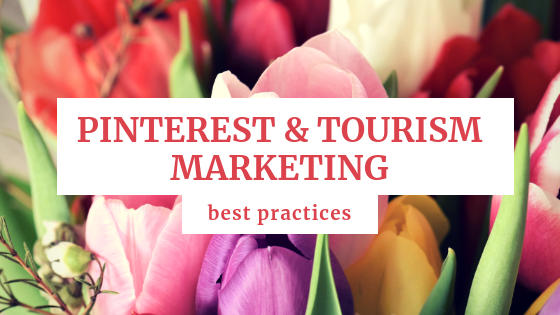 In this blog, we’ll explore Pinterest for destination marketing. Pinterest is an interesting beast. Part social media channel, part search engine; the inner workings of this channel can feel elusive at best, and straight-up confusing at worst. Through my own experience and a fantastic crash course from Practical Wanderlust, this blog will break down the basics of getting Pinterest boards going for your destination. You have to walk before you run. There are a few key things to make sure of before you embark on your Pinterest journey. Make sure your account is a business profile, not a personal one. Claim your website on Pinterest, so they know when you’re linking back to it. Craft a brief but informative bio. Make sure your profile photo is clear, bright, and looks good at a small size. Pins are content you and others create. This design is specific to Pinterest and usually involves a photo, with or without a text overlay and a description at the bottom. Boards are where your pins live within the organizational structure of Pinterest. This is where people and businesses collect and store pins for future reference and inspiration. Pinning is the act of adding pins (yours or others) to a board. Rich Pins have extra information at the bottom in the description so people don’t need to click the pin to find out more. These are great for engagement and driving traffic to your website. Pinterest explains the benefit of rich pins well. Re-pin is similar to a re-tweet, this means pinning other people’s pins to your boards. Before we dive into the time and effort Pinterest takes, make sure this is the right platform for you. There are many sources of data on who is using Pinterest, this article on Pinterest Statistics has a great overview as does this article on Pinterest Statistics for Marketers. The channel boasts an impressive 250 million active monthly users, and 50% of those users are from outside the United States. Over 80% of daily users are women and the median age of users is 40. However a majority of active daily users are under 40. And, half of Pinterest users earn $50K or more per year. This all adds up to a great way to communicate with family decision makers (since as an industry we know that women plan the majority of family travel) with disposable income. We have it a little easier in travel and tourism, as Pinterest for destination marketing is almost always a great fit. Pinners (the platform’s users) spend more on retail shopping and start planning twice as early as non-Pinners. Not only that, but “49% of US travelers who spend $1000 or more on travel are on Pinterest.” Pinterest is also one of the few platforms that actively encourages backlinks to other websites. In fact, Pinterest refers over 7% of all website traffic. Social media channels take time and work to maintain and grow, but Pinterest is another category unto itself. Like all channels, getting it started is the most labor-intensive part- so don’t click away when I tell you to expect to spend several hours per week for the first few months. I won’t deny or downplay that this is a lot. But it is worth it. Pinterest boasts several benefits the other social media channels can’t touch. The half-life of a Pin is 3-6 months. Compare this to Twitter’s 24 minutes, and it starts to make sense why more work is needed up front. The average pin is re-pinned 11 times. Pinterest doesn’t require the same kind of monitoring or engagement of Facebook and Instagram. 87% of people said that using Pinterest influenced their buying decisions. Push out new pins consistently. Pinterest prefers consistent content creators. Share pins created by other people regularly. The platform puts an emphasis on sharing other people’s content. Pinterest highly regards engagement with other people’s pins. The increased impressions on your username and someone else’s pin can lead to more traffic to your boards. Pinning high-quality pins (yours or others) makes Pinterest think you’re a high-quality user, and encourages more traffic and impressions to your boards and pins. Quality is important because popularity is determined by engagement on a pin. This engagement can be anything from making the photo on the pin larger to clicking through to your site. So, make sure you get your audience to stop scrolling when they see your pin! A high-resolution vertical photo that evokes emotion in people. It makes them feel warm and fuzzy, or inspired. Stock photos are okay on Pinterest, and many people use them. Context around the URL and topic of the pin. No more than three fonts. Clear, easily readable text that is large enough to read when the pin is small. Focus on the primary keyword. Pinterest, like most social channels, is extremely visual. Poorly created pins will quickly be lost or ignored. If you’ve created pins in the past that are under-performing, or not as well-designed as you would like, feel free to re-create and re-post them. It can be easy to look at Pinterest and feel overwhelmed with options or to feel like your destination can’t compete. Don’t sell yourself short! Canva is a free site with hundreds of templates to get you started on the design end. (Discover more low-cost marketing tools.) Don’t reinvent the wheel for content- you’re already sitting on a goldmine of pins. Any blogs or posts that help a visitor plan their trip will do well. Post a blog on insider tips on your destination, like things that take visitors off the beaten path to local favorites. Create a board for existing sample itineraries. Pin your latest travel guide. Have a board for any wine or food trails. Create boards around the different categories in your area like things to do, places to eat, etc. For more inspiration, check out the boards on the Travel Oregon and Visit Buffalo Niagara Pinterest accounts. Set up a business profile and claim your URL. Write a concise bio and upload a profile photo. Create a few simple boards that a majority of your content can live on. Dedicate a half-hour a day to keeping your boards active for a few weeks. After that, dedicate 30 to 45 minutes each week to creating and pinning new content that leads to your website. Also put in a few minutes for re-pinning other’s pins. In a few months, your Pinterest will be mostly self-sustaining, with far less time needed on your part! For more great insights on why Pinterest for destination marketing is a valuable tool, check out the Destination on the Left episode with TravelPinners.